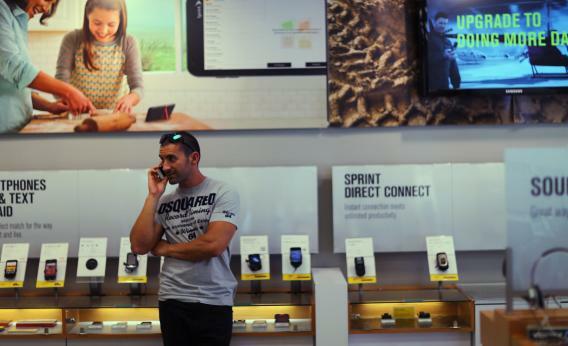 NSA PRISM phone records spying: Scope expands to Sprint Nextel, AT&T, credit-card transactions. Sprint Nextel is among the companies the National Security Agency has being receiving data from its customers’ phone records. Revelations about the scope of the National Security Agency’s spying just keep on coming. Now, new reports say the top three major U.S. phone networks have been handing over masses of phone records as part of a sweeping secret program—and the data has in some cases been shared with spies in the United Kingdom. On Wednesday a classified court order was revealed showing that a Verizon business subsidiary had been ordered to hand over millions of records of phone calls made and received by all customers. The disclosure has prompted a backlash from civil liberties groups, but lawmakers have tried to play it down by saying that the data collection is lawful and has been going on for at least seven years. It separately emerged that the NSA is operating a vast Internet monitoring program calling PRISM, reportedly gaining access to the internal servers of the world’s largest tech companies—including Google, Microsoft, and Facebook—to spy on communications and record troves of other private data. In a drastic move following the series of disclosures, James Clapper, director of national intelligence, released a statement Thursday in an attempt to address concerns about the scope of the NSA’s spying. In an apparently unprecedented decision, Clapper declassified information about a section of the Foreign Intelligence Surveillance Act in order to address specific details about the secret surveillance. He admitted the data collection was “broad in scope” but said it was “lawful, subject to stringent restrictions,” and necessary to protect against terrorist threats. Clapper added that the U.S. intelligence community was committed to “respecting the civil liberties and privacy of all American citizens”—which won’t do much to reassure the billions of people around the world who have read about PRISM’s capabilities but are not American citizens.